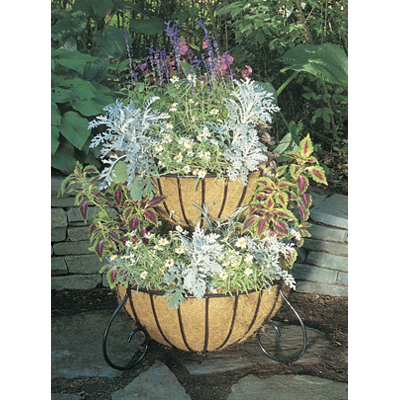 Spectacular moveable features that dress up paved areas, this planter is ideal for trying out foliage combinations to create dramatic displays of color. The upper level basket slips into the level below. Three gracefully curving legs elevate the bottom basket off the ground. All hand-welded steel, coated in black plastic. Planter only-liners not included. See item CLTC24N for flat replacement liner set or MLTC24N for the molded set. 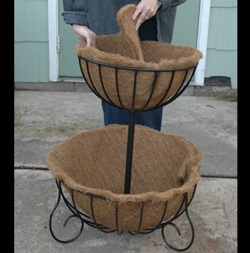 Please note that you will have to disassemble your planter to use the molded set. Take extra care when assembling to make sure the top tier is scure can be loose otherwise and after dirt is added it can be too late. Otherwise the are stunning when planted up!